Can You Turn America’s Pastime Into A Game Of Yahtzee? Welcome to The Riddler. Every week, I offer up problems related to the things we hold dear around here: math, logic and probability. There are two types: Riddler Express for those of you who want something bite-size and Riddler Classic for those of you in the slow-puzzle movement. Submit a correct answer for either,1 and you may get a shoutout in next week’s column. If you need a hint or have a favorite puzzle collecting dust in your attic, find me on Twitter. Given those rules, what’s the average number of runs that would be scored in nine innings of this dice game? What’s the distribution of the number of runs scored? (Histograms welcome.) You can assume some standard baseball things, like runners scoring from second on singles and runners scoring from third on fly outs. Figuring the statistical outcomes of the 130-year-old game described in Riddler Express may be a bit outdated, so you decide that you can do better. You get to work making your own list of dice rolls, tweaking what corresponds to each roll to better match the real distributions of baseball run scores. You should be using that same set of standard baseball assumptions about when runners score (sacrifice flies, runners scoring from second, etc.). Once you’ve matched the run-scoring environment, try to add other variables to your computations. What if you try to simulate strikeouts per game, batting average, etc.? In other words, how closely can you simulate the grand, yet subtle, complexities of the national pastime using only a pair of cubes? What does your roll list look like? Congratulations to 👏 Silviana Russo 👏 of Brooklyn, New York, winner of last week’s Riddler Express! Last week brought us some puzzles from a board game called Hex, as sent along by Ryan Hayward, a professor of computer science at the University of Alberta and the author of “Hex: The Full Story.” Here are the rules, once again: The board is an array of hexagons. Two opposing sides of the board are black; the other two opposing sides are white. One player has the black sides and black stones; the other player has the white sides and white stones. Players alternate turns. On a turn, a player puts a stone of their color in an empty cell. The winner is whoever joins her two sides with some unbroken chain of her stones. In each puzzle, it was white’s turn to move, and white could guarantee a win — there was a single correct move in each puzzle. 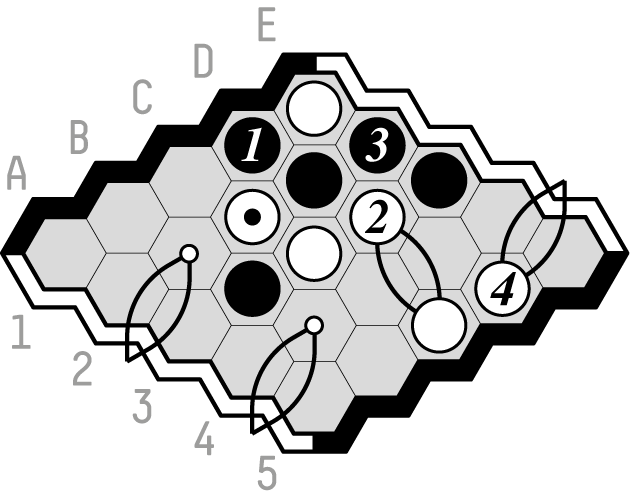 The white player can guarantee a win by placing a stone in the central hexagon. Why? Solver Mark Bradwin provided the following helpful annotated diagram of the game after white plays in the center of the board. 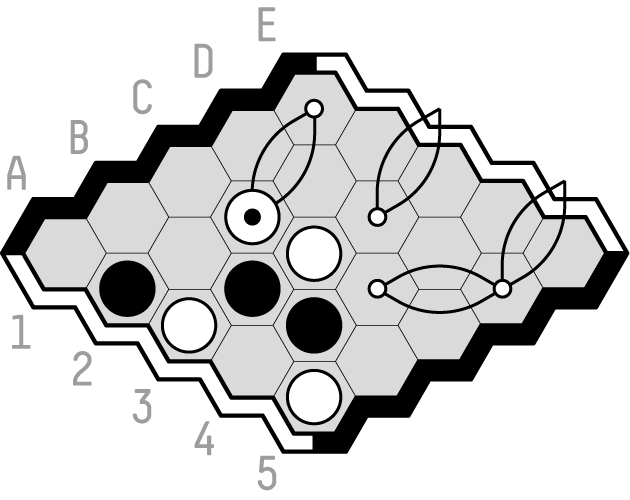 White has created two of what are called virtual connections in Hex — connections that haven’t yet physically been made on the board but that could be made for sure if a player wanted to. White’s stone in the center, for example, is virtually connected to the white border on the right, because there are two empty cells in which that connection could be made. Because the players take turns, the black player can only block one of the squares labeled A and one of the squares labeled B — white can claim the other if she chooses to, which she should. If white claims either one of the As and either one of the Bs, that will create an unbroken chain across the board, and white will win. Congratulations to 👏 Madeline Argent 👏 of Launceston, Australia, winner of last week’s Riddler Classic! 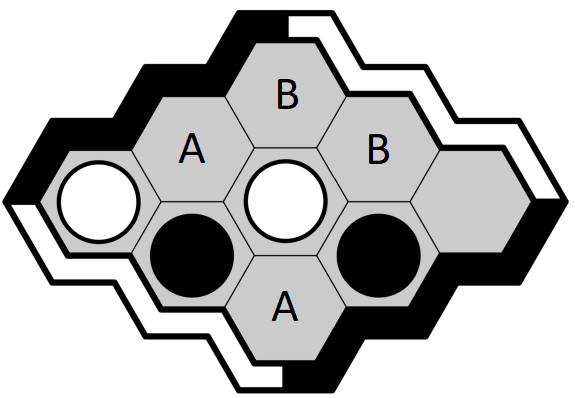 For Riddler Classic, the Hex boards got a little bigger, and the problems got a little tougher. The second puzzle was the position below. Again, it’s the white player’s turn to move — and to guarantee a win with the one correct move. White wins by playing at the position C2, as shown in the labeled diagram below. The order in which the subsequent moves are played is shown by the numbers on the stones. 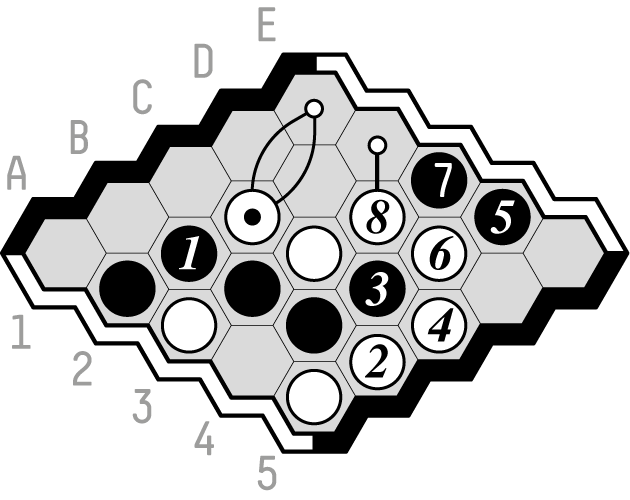 As Ryan Hayward explains, white’s group of stones at C2 and C3 can join the bottom edge with B2 or B4 — again creating one of those virtual connections to the white border, shown with the double lines representing two connection options. To keep this group from joining the top border, though, black can play its response at D1. White replies to this by playing D3, then black plays E2 and white finishes with D5. Again, white wins by playing C2! As shown in the diagram above, if black plays in column D or E, white plays C4 and then one of E1, D3 or D5; if black plays in another column and row 1, 4 or 5, white plays B2 and then one of E1 or D3. So black’s best response is B2. But in that case, white plays B5 (to block black’s own winning threat) and wins with the main line of play demonstrated in the diagram below. The numbers on the stones show the order in which the subsequent moves are played. Well, aren’t you lucky? There’s a whole book full of the best puzzles from this column and some never-before-seen head-scratchers. It’s called “The Riddler,” and it’s in stores now! Want to submit a riddle? Important small print: For you to be eligible, I need to receive your correct answer before 11:59 p.m. Eastern time on Sunday. Have a great weekend!